r686st had the most liked content! The truck is sold. Sorry for not being able to get pictures. So do the new Mack Granites not "regen" on the move? I thought the parked regen was an issue with the previous generation only? I am following this seriously since I am in the Market too. I would be leaving a '94 DM and getting a granite with air ride. 50/50 road and offroad driving. You have been very busy! I am impressed with the quality of the rebuild and it's how I did my superliner. If you were to sell it once you get done working on it what do you think you'd want for it? I have pictures I am just having trouble getting them from my phone to the computer. Do you have any suggestions on how to do so? Asking $30,000.00 firm List of repaired/replaced parts: wheel seals, drums, shoes, one brake canister, fluid/filters throughout the drivetrain, led headlights, led taillights, led dump box lights, dump pivot pin at the end of the frame, tires, seat, tarp, dump box liner, two way gate hinges, air gate cylinder, rebuilt dump hoist, back up alarm, apron, accelerator pedal, air valves on the frame, torque rods, slack adjustors, clutch, radiator, air to air aftercooler, complete ac system, complete am/fm radio system, wet kit including pump/controls and more. I am sure there is more but I maybe forgetting. This is a working truck so it will show some wear and it has a dedicate haul so mileage will go up daily. It currently has 200k on the odometer. I have a clean Louisiana title as well as the Mack build records that go with the truck. It is is located in Clinton, Louisiana. I own both of those engines in a DM and Superliner. The EM7-300 mechanical with pull with or out pull the 7 pin pump. Mechanical is my vote. HI I'm Kyle and I'm located in Clinton, LA. I have the pump, tank, driveshaft, fender skirts, chutes, water tank, gear box, drum and pedestal for sale. I am asking $4,000.00 cash/certified funds for everything. It is a one year of service live 10.5 cubic yard Mcnelius barrel that was put on approximately in 2010. 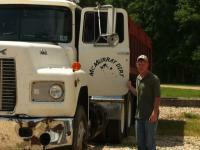 It was mounted on a 1994 Mack DM690 that I am converting to a dump truck. If you have any questions feel free to ask. Thanks for all the well wishes! I'm finally the dirty 30:) and considering Harvey is affecting us it still was a good one. How long is the blue dump box and how much do they want for it?